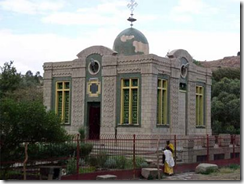 APOLOGETICA » Blog Archive » -Is the Ark of the Covenant Really in Ethiopia? The Orthodox Church of Ethiopia has claimed for years that they actually have the original Ark of the Covenant spoken of in the Bible. One of the problems with the claim is that they have never allowed archeologists to inspect or test the artifact which most scholars believe is a mere copy at best. 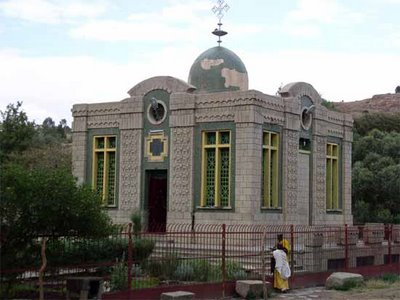 However, the Patriarch of the Ethiopian Orthodox Church has recently announced that he will be unveiling it for all the world to see very soon. Does that mean scholars will finally have access to the ark? Probably not. "All that which is found in the Ark is described perfectly in the Bible. The state of conservation is good because it is not made from the hand of man, but it is something that God has blessed. There are many writings and evidences of the presence of the Ark in Ethiopia. There is no reason why someone [would] dare to affirm to have something that he doesn’t have. I am not here to give proofs that the Ark is in Ethiopia, but I am here to say what I saw, what I know and I can attest to. I didn’t say that the Ark would be revealed to the world. It is a mystery, an object of veneration." Response: So the mystery continues. No real unveiling and no scholarly archeological inspections at all. I guess the truth of the matter and a real resolution of the issue is not to be tolerated or allowed. It is to remain an object of faith only for the Ethiopians. 4 Responses to -Is the Ark of the Covenant Really in Ethiopia? Well as an Ethiopian I must say it is un wise to show the ark because many people like your self who as far as I could tell has a positive attitude towards the ark might want to know the truth but what we are afraid of is that there might be people with evil means recently the locals of the area has found people with agendas to retrieve the ark which are directly funded by the Israeli government I know that from a first hand information sores who was present in the scenario. Imagine the damage it well cause on our church which by the way is one of the oldest in the world and still is preserving its merits and for a country like ours its not wise to show the ark to the world not because we don’t want to but because we don’t have the capacity to triumph over the outcome and believe me is what every Ethiopian is thinking so do you want to see the ark? gust be patent and have faith like a real Christian and TIME WELL REVEALL EVERY THING and for the dought you have, YES WE HAVE THE ARK OF COVINANT !!!!!!!!!!!!!!!!!! !.